We have been watching for a Monarch butterfly to visit our garden for the last several weeks. We still have Yellow Sulphurs and Painted Ladies. But most of the Swallowtails took off before our storms. We miss them. The garden has felt quite lonely and empty without them flying around. 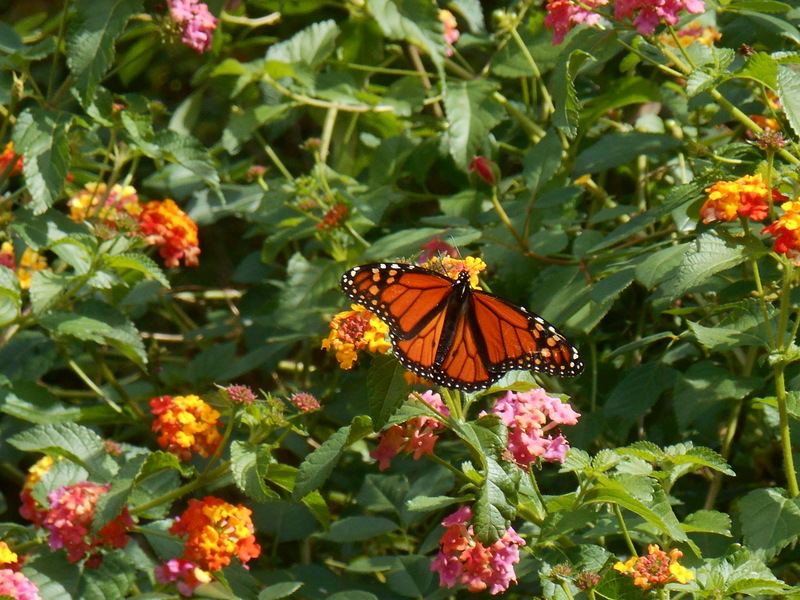 But we started spotting Monarch butterflies on our errands this morning. We saw them hovering over flowering shrubs at the shopping center. 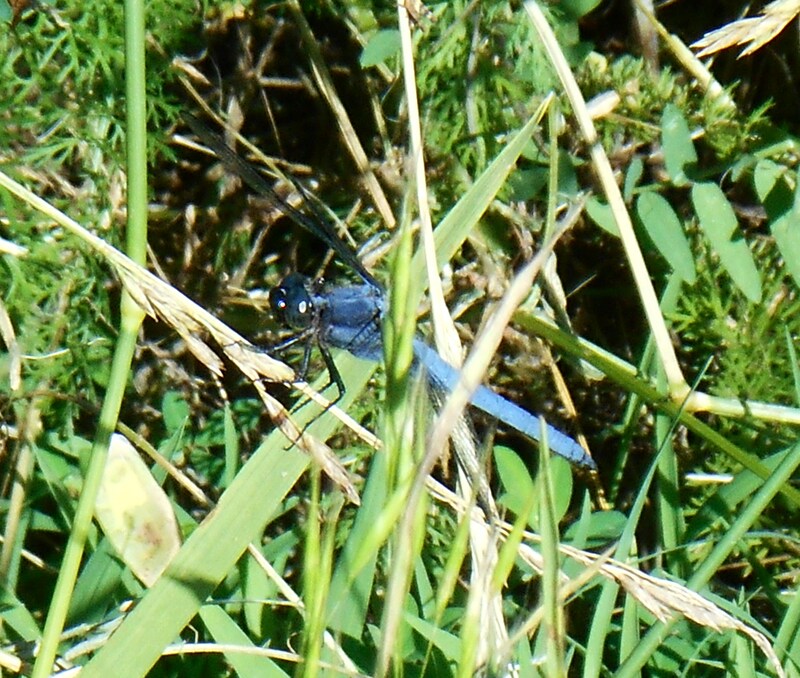 We saw them flying about near the Colonial Parkway. When would one turn up at home, we wondered? 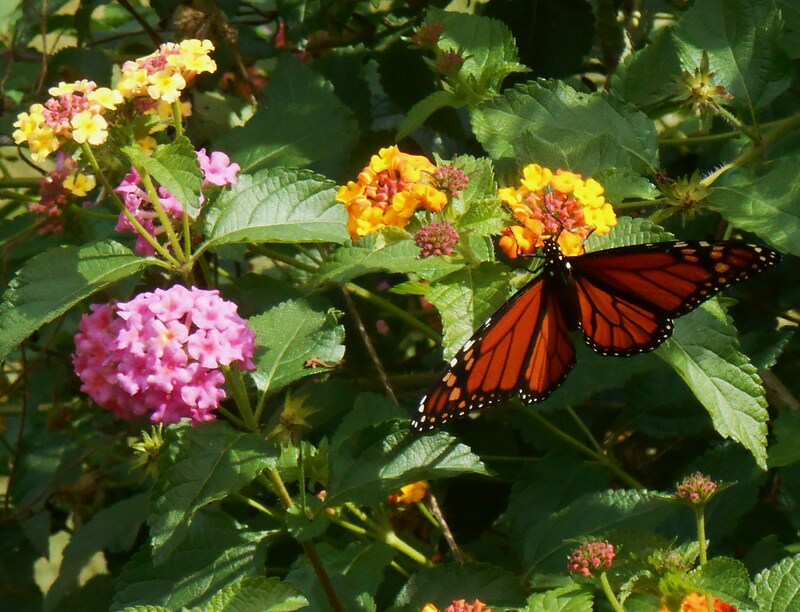 And then at dusk, as I was bringing a pumpkin around to set on the front porch, I spotted our first Monarch butterfly of October, feeding on the Lantana in our front garden. What a thrill! After the joy of simply watching it for a while, I quietly retreated back inside to tell my partner about our visitor, and to grab my camera. 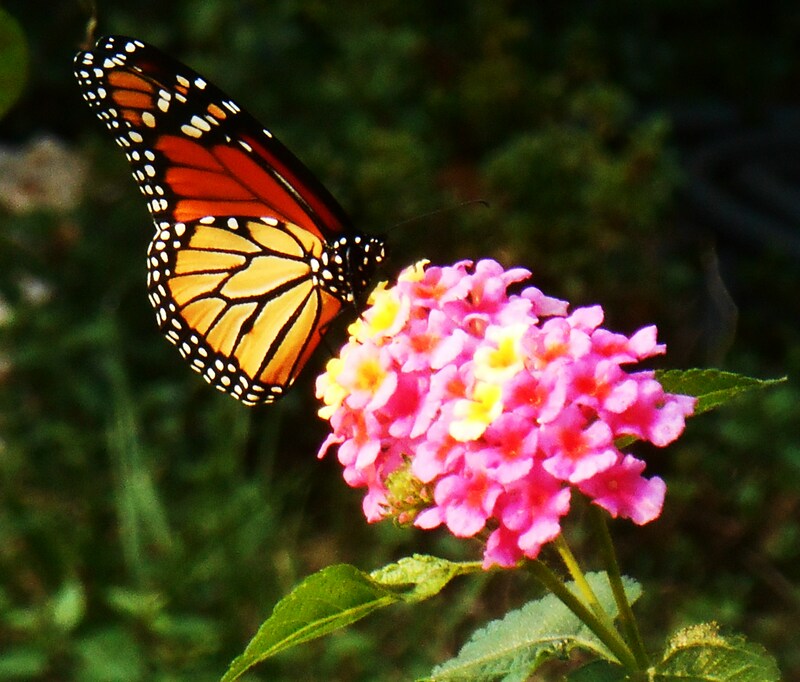 Wondering whether our Monarch would still be around when I returned, I powered up the camera and quietly approached the Lantana again. And yes, our visitor was enjoying the feast too much to mind my presence. I was happily snapping photos as my partner approached, watching from a distance. Maybe it was the socks…. Today I chose a pair of Monarch butterfly socks my partner had given me in late August. All stages of a Monarch’s life from egg to adult are woven into these wonderful socks, which we found in the shop at Brent and Becky’s Bulbs in Gloucester. I pulled them on this morning hoping to soon finding Monarchs visiting us on their fall migration. 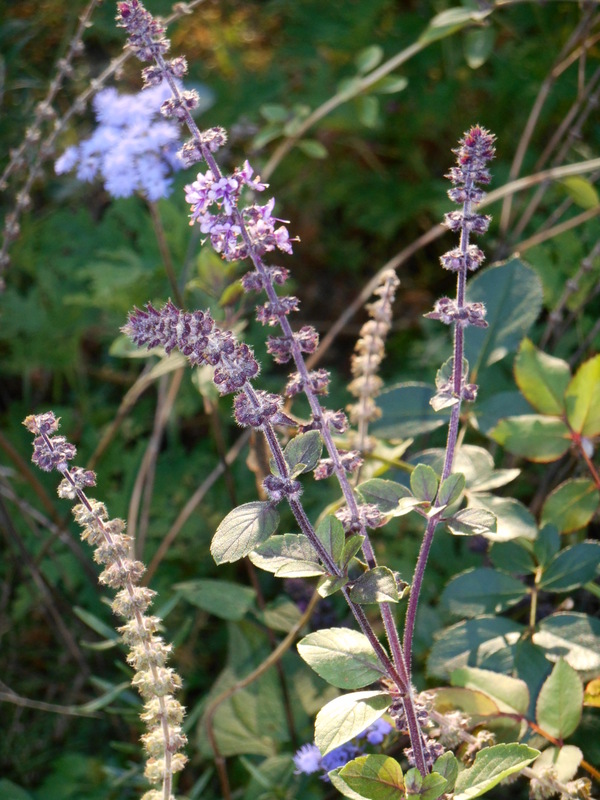 Now that the storms have passed, and clear cool days have brought a new freshness and vitality to our garden, we observe renewed activity from birds devouring ripening berries and bees enjoying Goldenrod and autumn Salvias. And now our garden has finally hosted the long awaited royal visitor: a lone Monarch butterfly feeding in our garden as it travels to warmer destinations further south. We hope this is the first Monarch of many who find our garden this month. We hope to find it alive again with the flutter of brilliant wings, as they taste each blossom filled with sweet autumn nectar. Orange does liven things up a bit. Its warmth and energy feel like the perfect foil for the icy garden outside our windows. Just as orange juice brightens up a wintery morning, so a collection of orange photos might make us all feel a bit warmer as we close out this first full week of March. 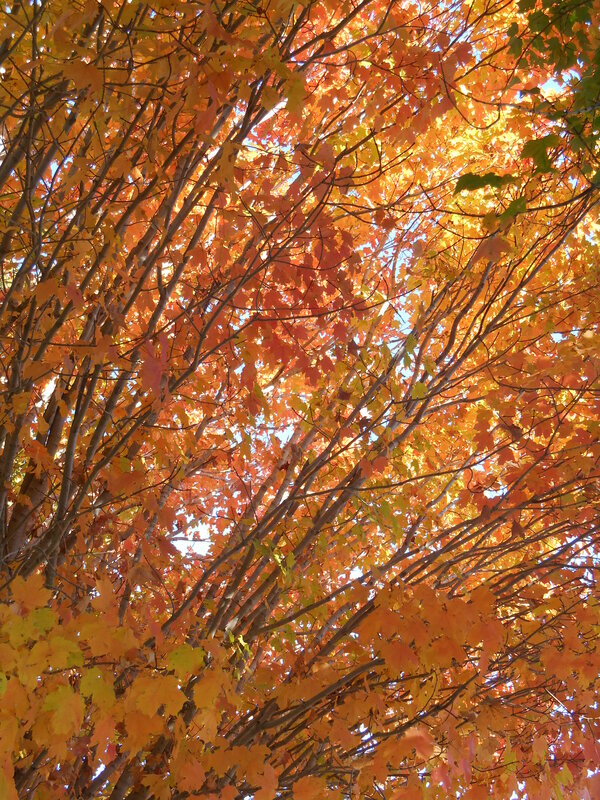 When I think of orange, I think of October. 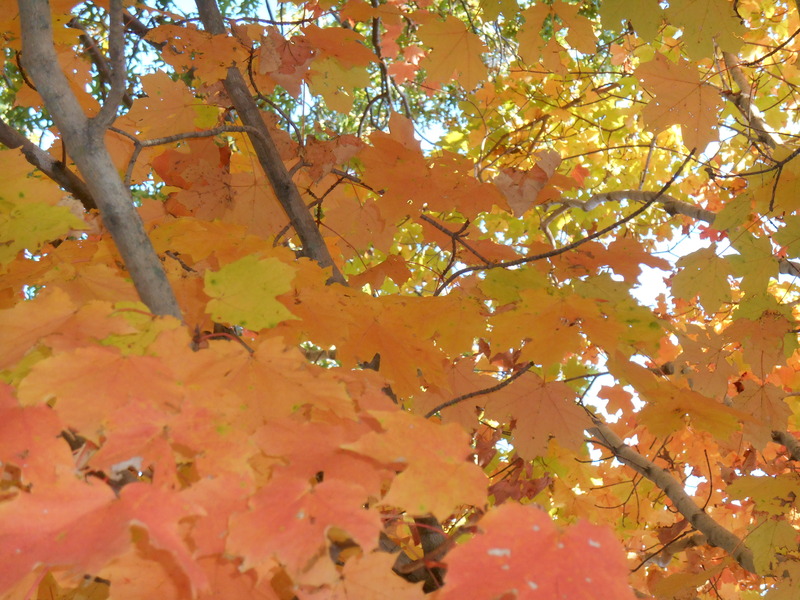 Today’s collection of photos, all from October of 2014, take us back to butterflies and roses; leaves changing color on the trees and warm autumn sunsets. 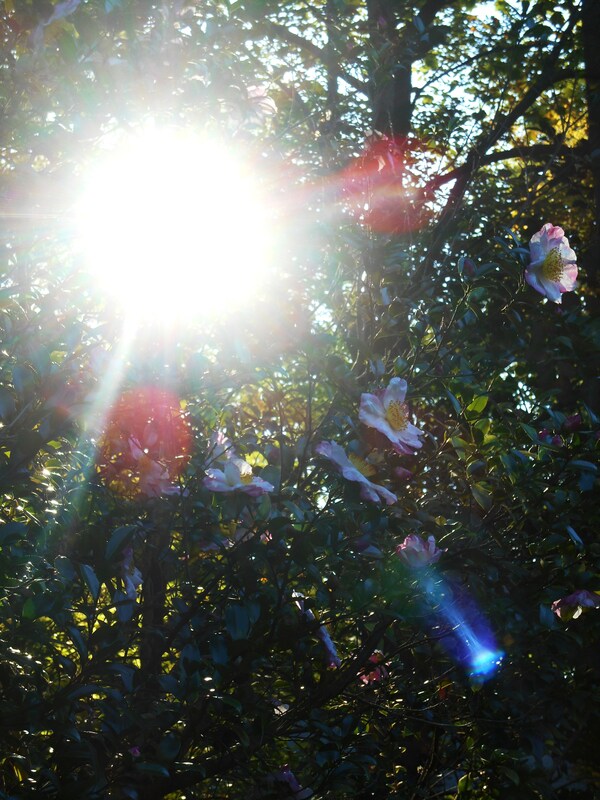 I hope you will soak up a little of their warmth as you enjoy this photographic retrospective. 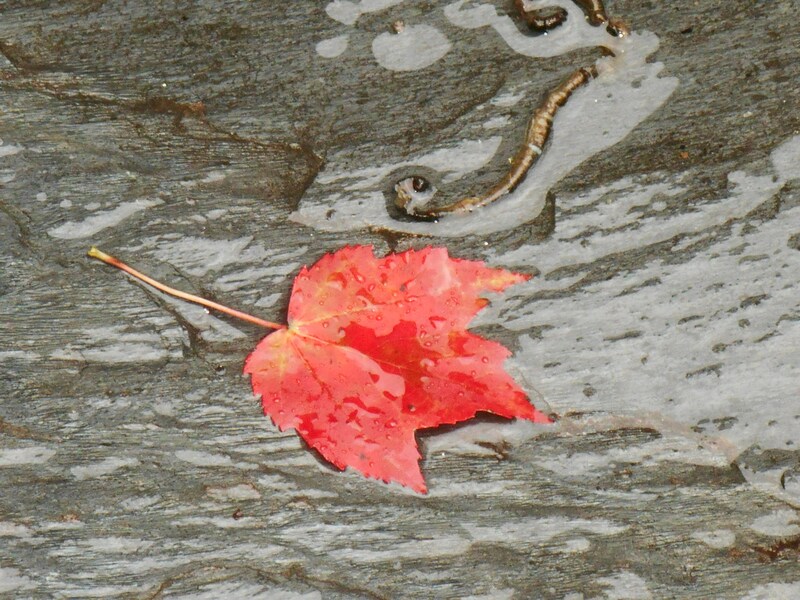 After a summer spent watching for butterflies, we celebrate each one which crosses our path this October. I say, “Crossing our path” intentionally. We cringed each time a Monarch came fluttering towards the windshield as we drove along the Colonial Parkway this weekend. We believe they all survived, carried in the wind over the roof of our car and safely on their journey. Often, as I stopped to take photos, familiar orange and black wings lit somewhere nearby. 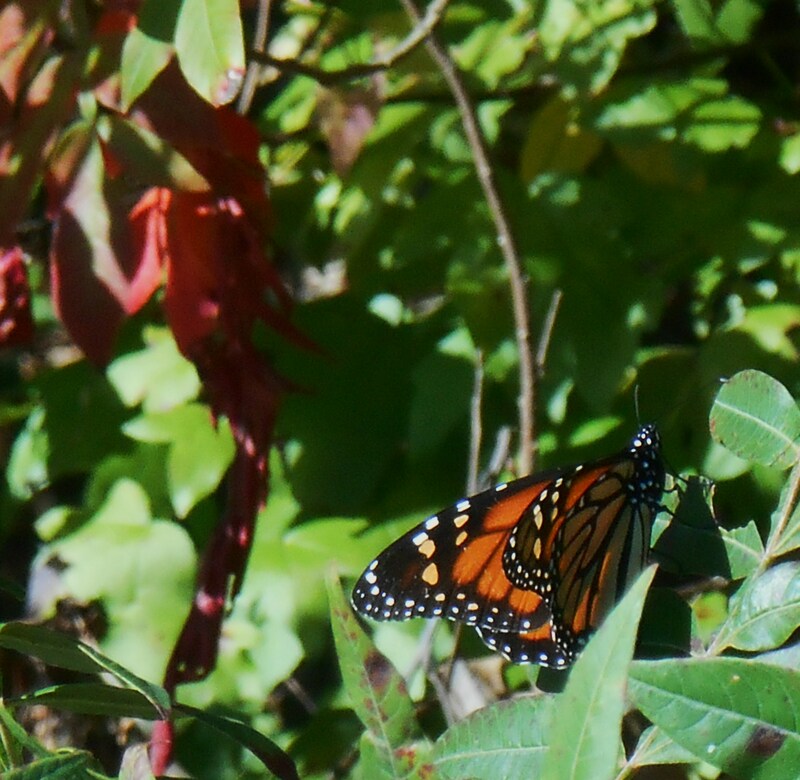 Monarchs and Painted Ladies delight us as they flutter around our garden on these warm, late October afternoons. 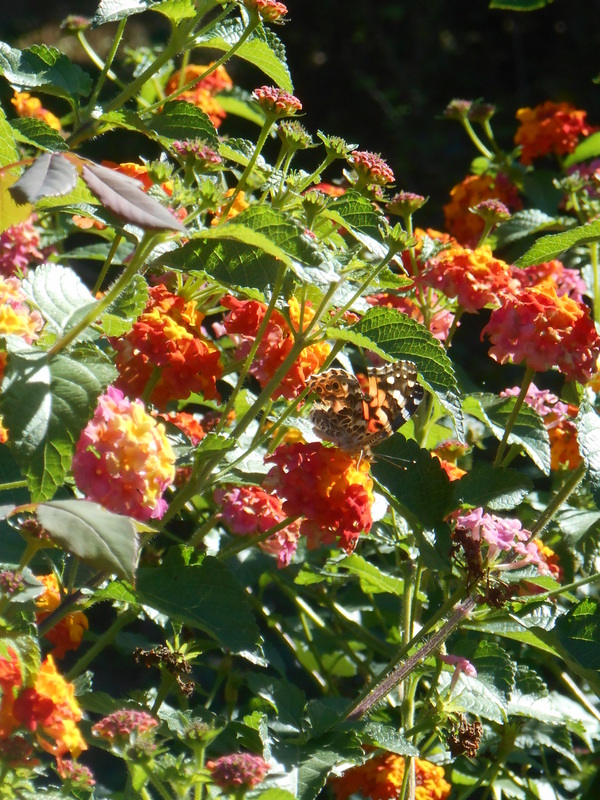 A Painted Lady enjoys nectar from Lantana in our garden. Paging through the new “Winter” issue of Arts and Crafts Homes, I was a little surprised to see a photo of Monarch butterflies crowded on an evergreen branch. Since the butterfly is a common motif in “Arts and Crafts” decor, the decline in our butterfly population rated an article even here. Artist Amy Miller is raising Monarch butterflies in her kitchen! The article explains how Amy set up a “mating tent” made of mosquito netting in her home, stocked with nectar flowers and fresh milkweed. Amy brings pairs of butterflies to the tent, releasing the males back into the wild after mating. Females are kept until they lay their eggs on the milkweed. Amy carefully raises the caterpillars until mature butterflies emerge. Thus far, Amy has released more than 500 adult monarchs back into the wild. 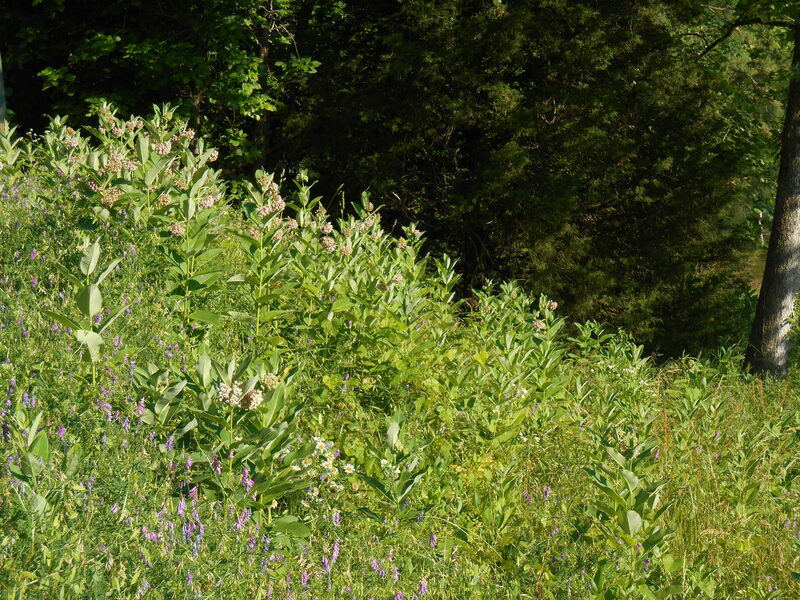 Her 27 acre property along Wisconsin’s Trimbelle River, is a natural habitat for Monarchs. Also mentioned was fellow blogger Kim Smith, who initiated the Cape Ann Milkweed Project in Gloucester, Massachusetts. Kim distributes milkweed seeds and encourages homeowners to create more habitat for Monarch butterflies. 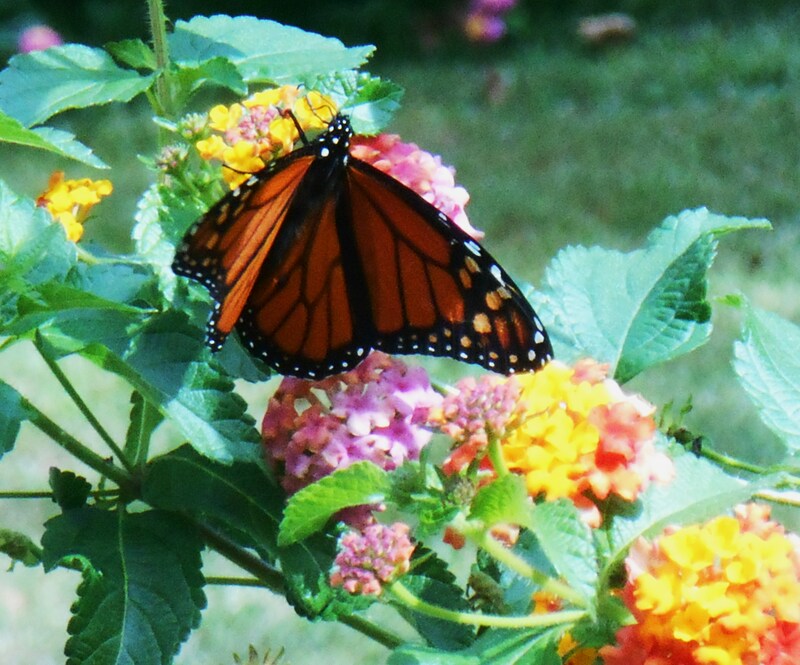 Kim often blogs about Monarchs and her efforts to support gardeners around the country willing to grow their host plant. 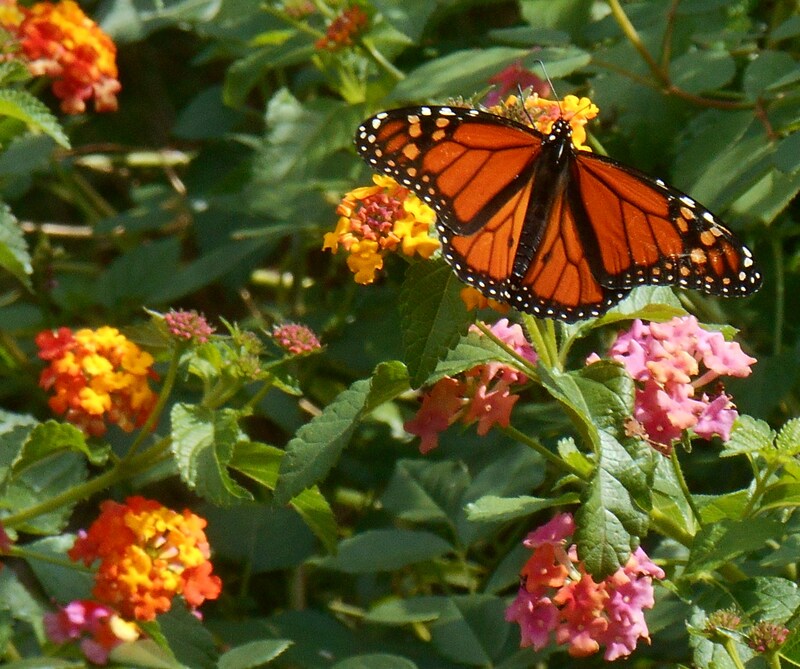 Milkweed is the only plant on which Monarch butterflies will lay their eggs. Monarch larvae eat only milkweed as they grow. 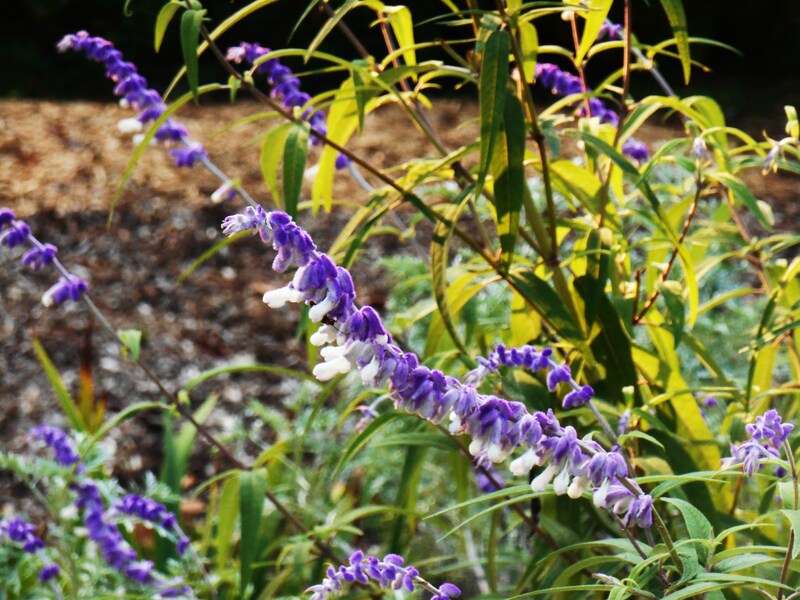 Often considered a weed, few homeowners include it in their landscape. Monarcch on Staghorn Sumac along the Colonial Parkway this weekend. 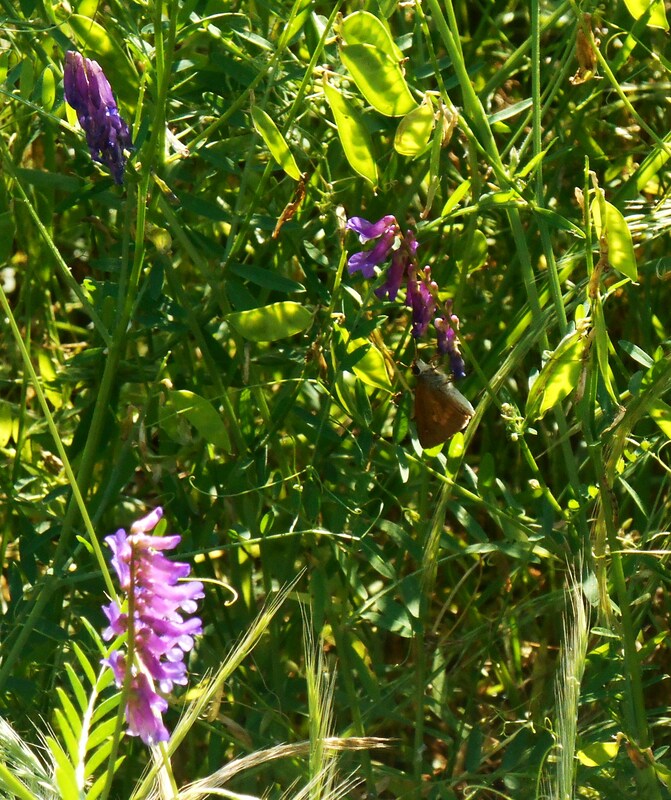 As natural areas, and the native plants they support, disappear; and roads, neighborhoods and shopping centers proliferate across the landscape; we see the direct consequences in our dwindling butterfly populations. 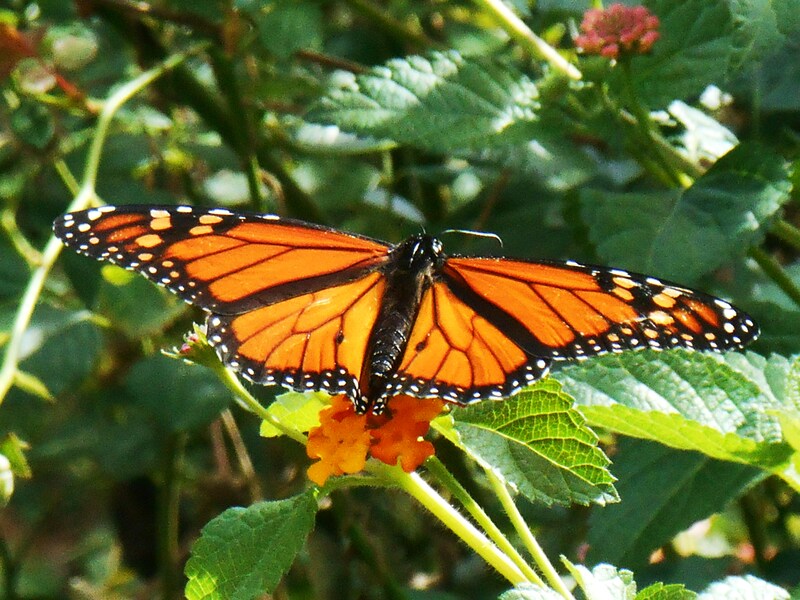 Many of us in the blogging community have written about our search for Monarchs and other native butterflies this season. Many of us share the concern that they haven’t visited our gardens in their usual numbers this summer. 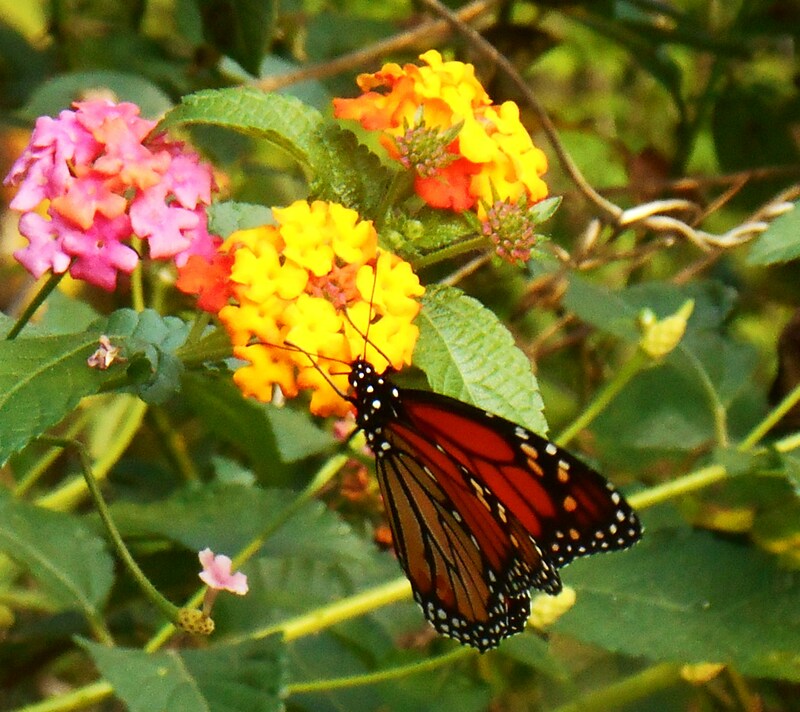 This male Monarch has made himself at home in our garden, enjoying the Lantana buffet these last few weeks. Do you see the spots, near the body, on his rear wings? These spots indicate a male butterfly. 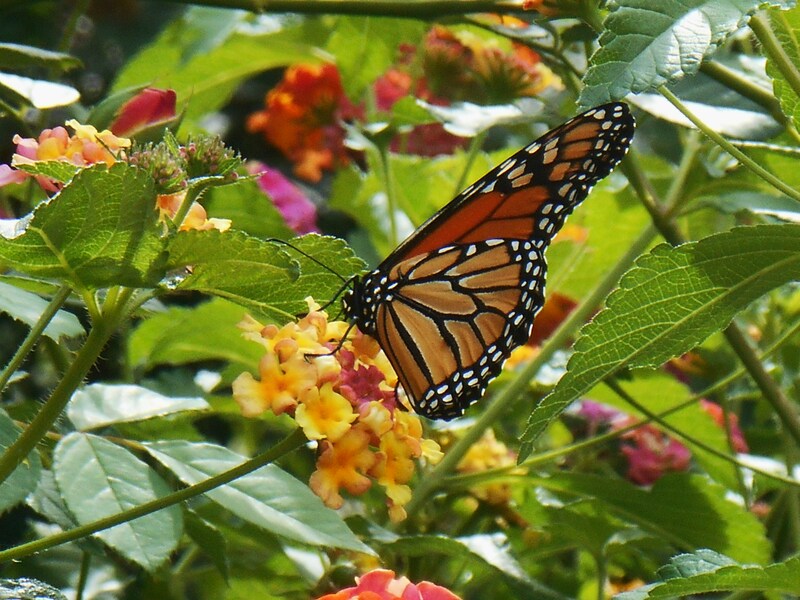 Eliza Waters, another Massachusetts based blogging friend, also documents her efforts to support the Monarch population in her gardens. Much like Rachel Carson raised the alarm about our native birds in her 1962 Silent Spring, so our generation documents our concerns for the butterflies. Carson’s book launched the environmental movement in the United States, bringing about sweeping changes in our laws; eventually banning DDT and other harmful insecticides and pesticides. And now, more than 50 years later, we witness a resurgence of the environmental movement inspired, in part, by the loss of our beloved butterflies. 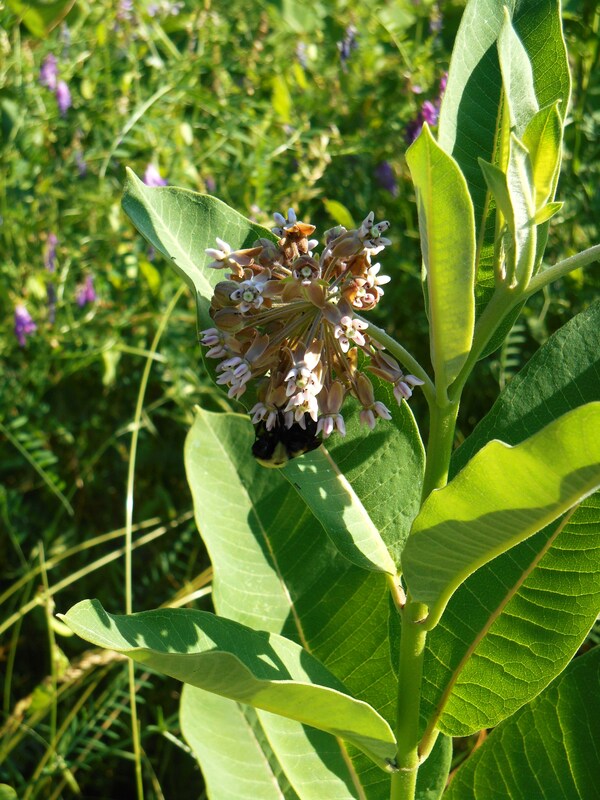 We know that herbicides used in commercial farming, along with over development, play in a major role in the loss of both milkweeds and the nectar flowers Monarchs, and other butterflies, depend upon for their life cycle. And although this problem appears very large, each of us can do our own small part to make a positive difference. We can each have our own tiny “Butterfly Effect.” Do you know the term? Edward Lorenz coined the term in 1961 to describe how one tiny change in the initial conditions of a system may dramatically effect the outcome. It is an axiom of Chaos Theory. And while we might feel helpless to have much effect against multinational corporations spraying herbicides on their GMO crops, or the energy giants building thousands of miles of new gas pipelines across our communities; we can create a safe and supportive habitat on our own properties for butterflies, frogs, songbirds, and the other beautiful little creatures whose presence indicates a rich web of life in our garden. We can plant milkweed for the Monarchs. And we can plant fennel, parsley, dill, black cherry trees, and other native trees to host the other butterflies we love. Even those of us gardening on a condo balcony or patio can grow these simple host and nectar plants in pots. Every tiny effort makes a positive difference. 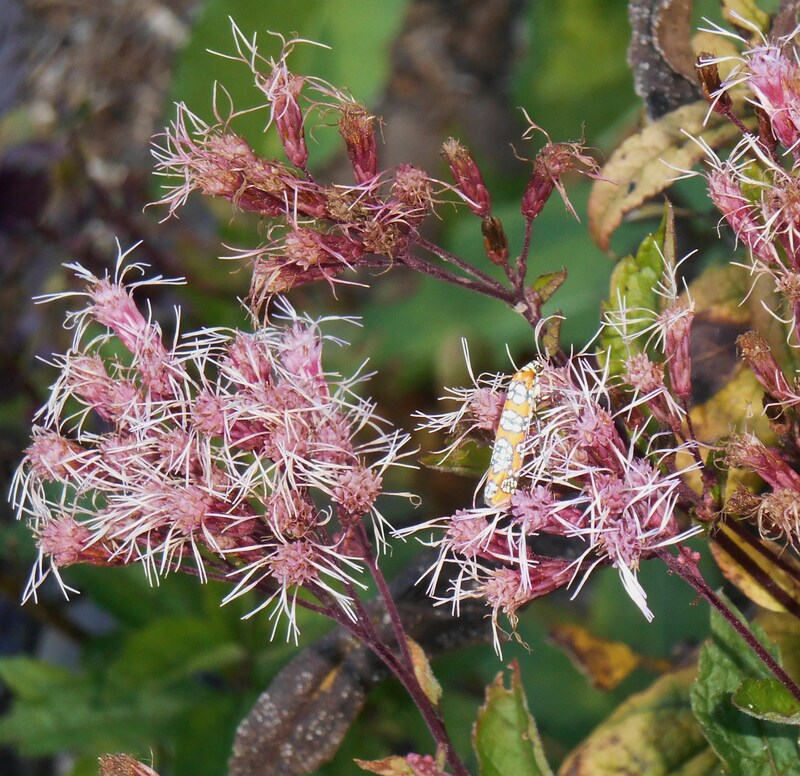 Joe Pye Weed, new in our garden this spring, has fed many creatures over the season. We can stop using pesticides, herbicides, and chemical fertilizers in our gardens, thus keeping them out of the water supply and out of the food chain. 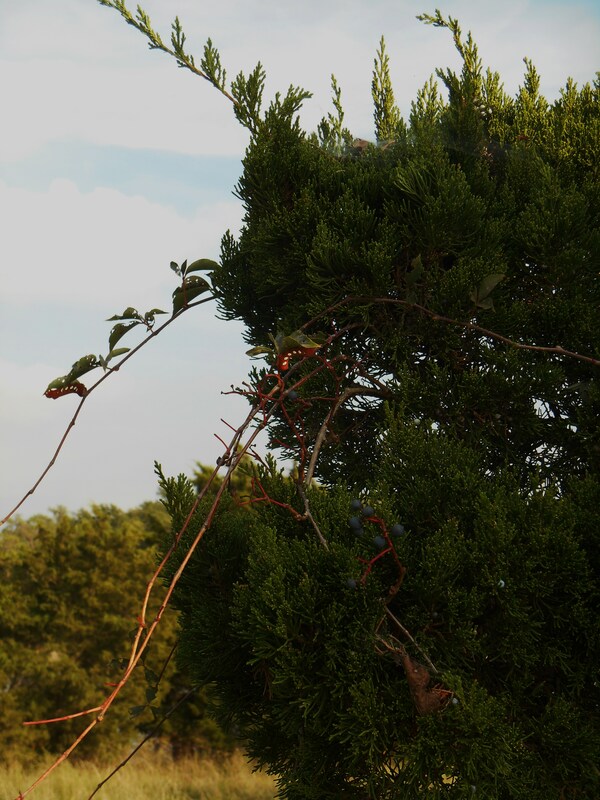 Unknown larvae feed on Virginia Creeper vines growing on this Eastern Red Cedar. 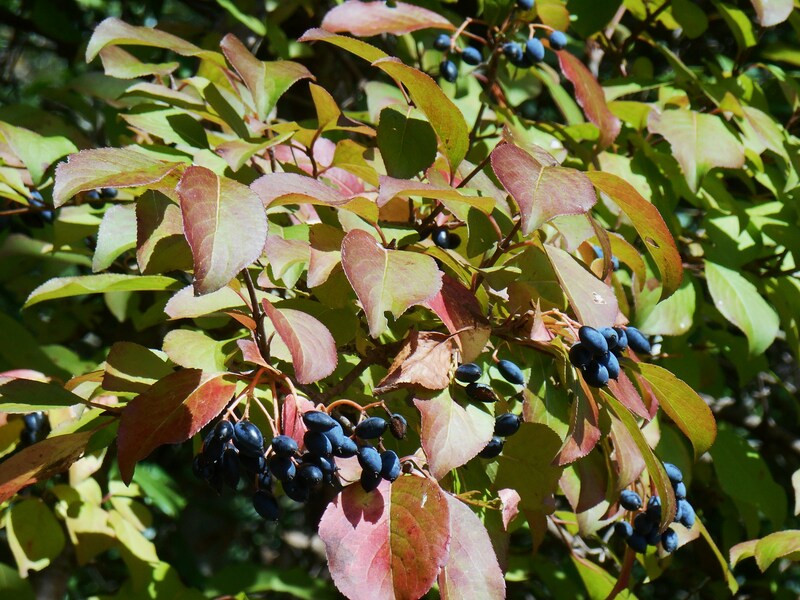 We can include berry and seed producing shrubs and trees in our garden, and leave some untended “wild” places for creatures to nest and shelter. 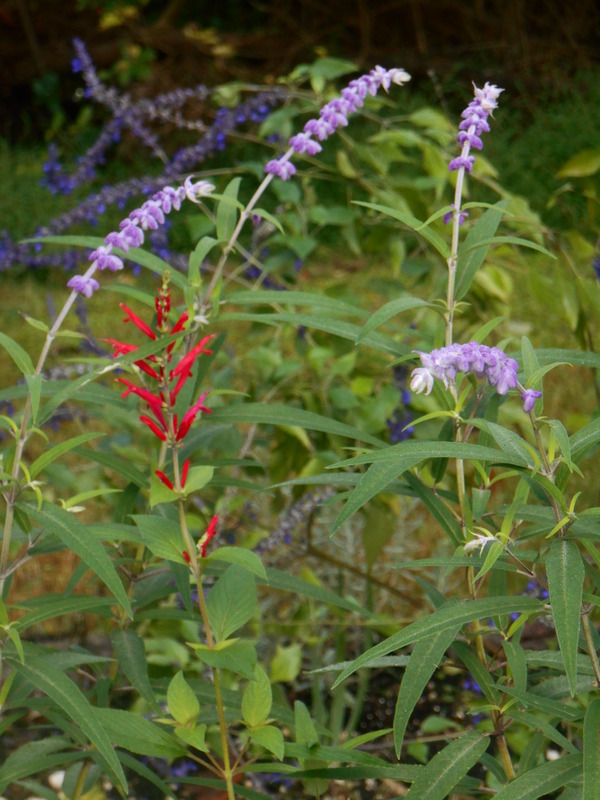 And we can support our neighbors in their efforts to create wildlife habitat in their own gardens. 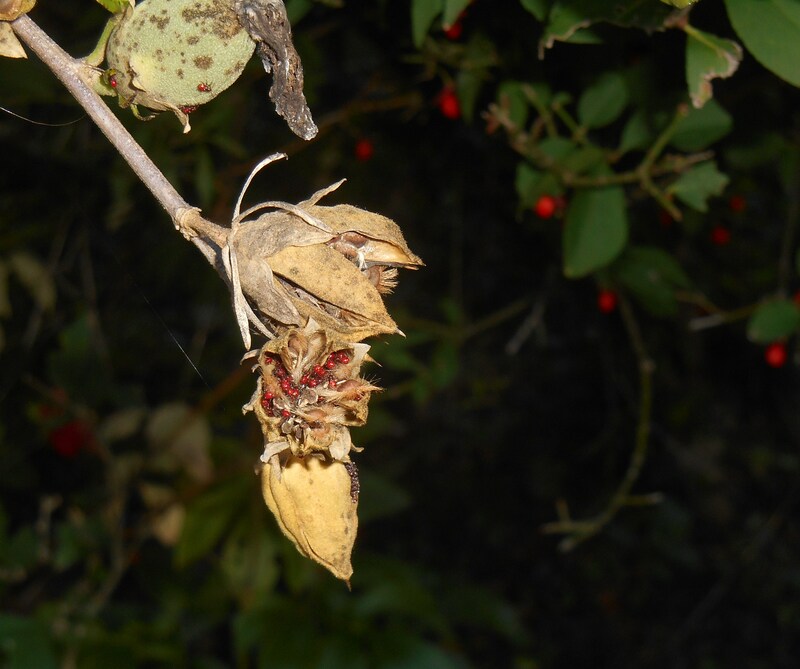 MIlkweed pods bursting to release their downy seeds is a sure sign of October in Virginia. These grow beside College Creek in our community. Let us all keep “The Butterfly Effect” in mind. In our seemingly chaotic world, every small act of kindness and goodwill has the potential to make an enormous difference as our story unfolds here on Earth. Every milkweed seed we nurture may host hundreds of Monarch butterflies. Every bit of garden we cultivate may feed thousands of creatures. Monarch spotted feeding in our garden this morning. Monarchs have returned to our garden. 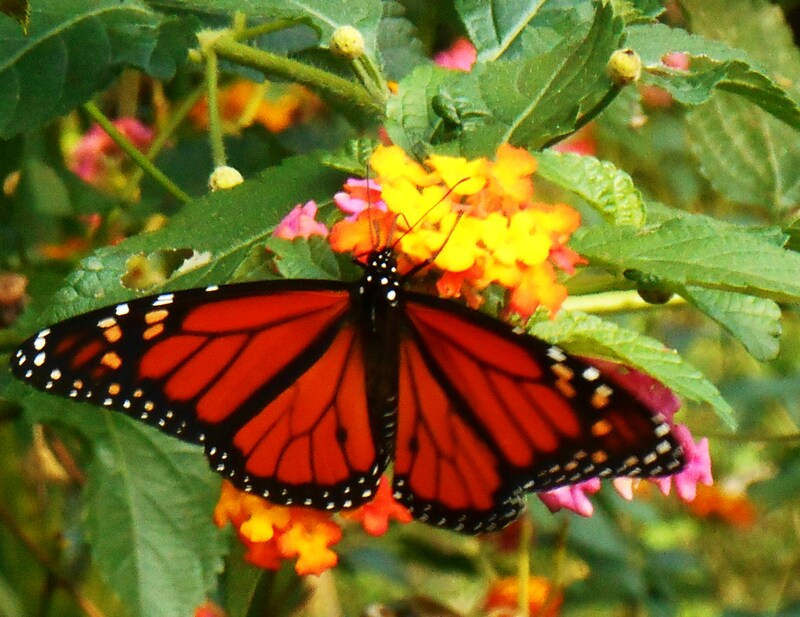 In the past three days I’ve seen Monarch butterflies feeding on several different occasions. The first time wasn’t in our garden at all. It was Sunday afternoon in far western Chesterfield County. I was driving out towards Amelia, and made a “U” turn to return to a little roadside nursery. 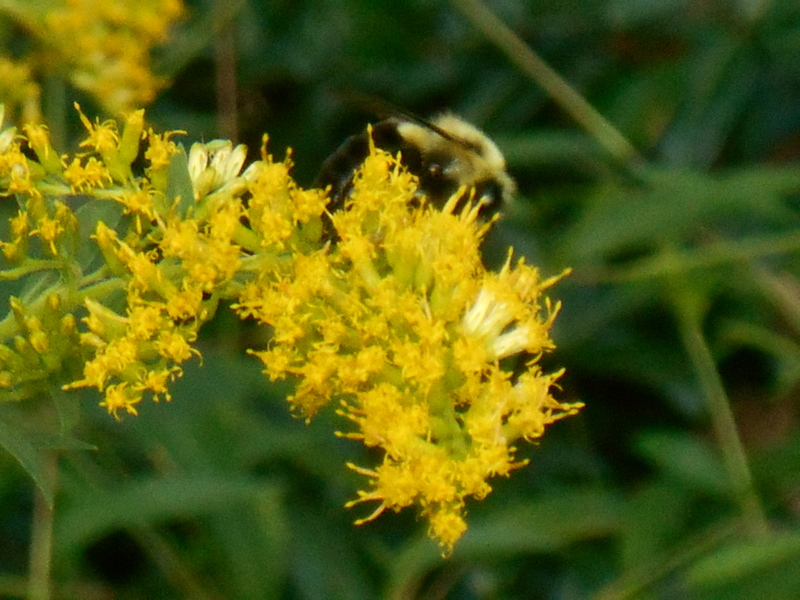 There was a small stand of goldenrod growing in the median, and to our delight, a beautiful Monarch was hovering over the goldenrod. I was thrilled to finally see one again after watching for them all summer. And then this morning, a Monarch flew past our porch, and lit in the upper branches of our pear tree. We watched it until it took off again. We took it as a very good omen. Especially since my partner had found, and shared with me, an article about cooperative preservation efforts involving Canada, The United States and Mexico in the current Scientific American magazine yesterday morning. It is always good when our nations cooperate. To find a high level of dedication and coordination in an effort to save the Monarch butterfly is astounding. 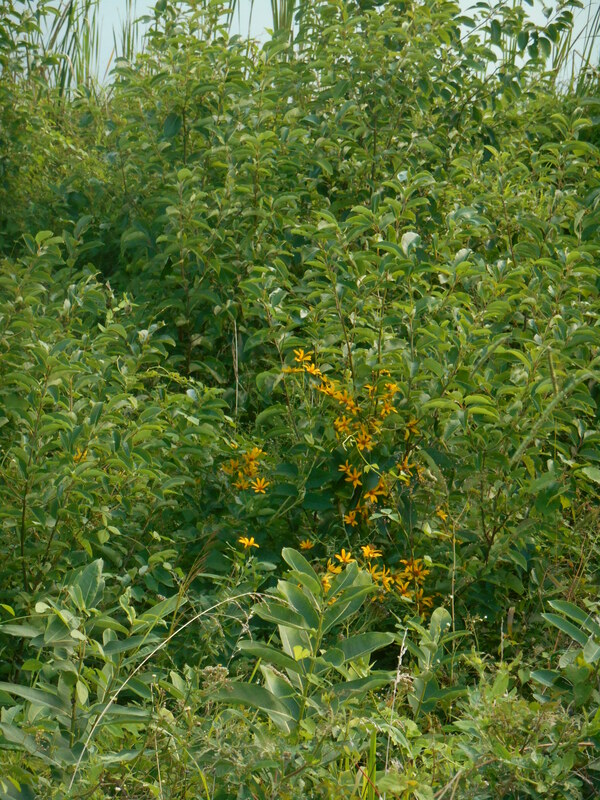 One idea mentioned in the article, which shows a lot of promise, is to establish corridors of native plants, especially milkweed species, along certain north-south interstate highways. 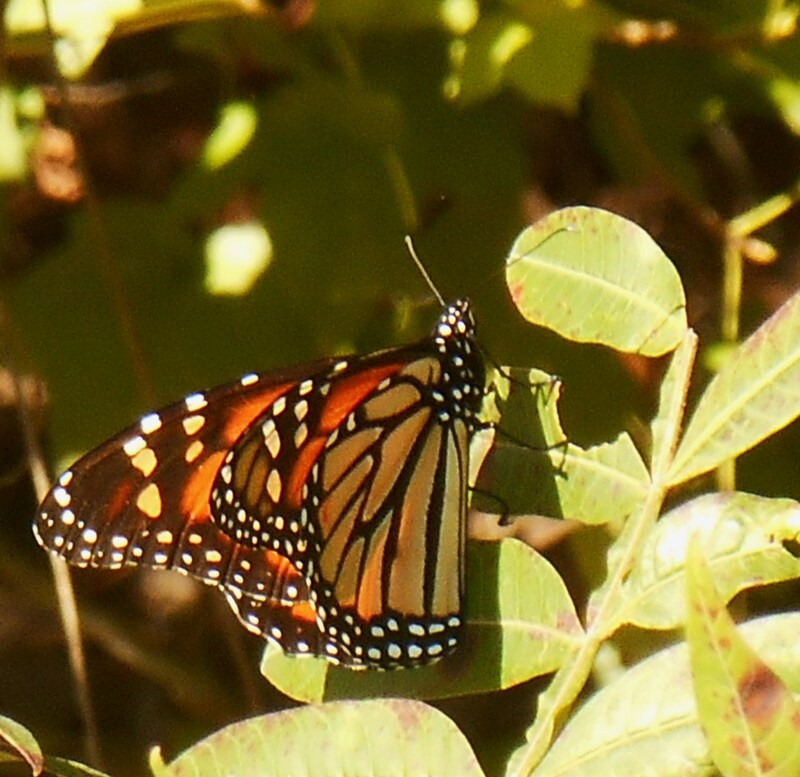 Monarchs need habitat and food all along the way of their annual migration. This is such a good idea, it begs the question: Why not establish native plant habitat along ALL of our interstate highways? 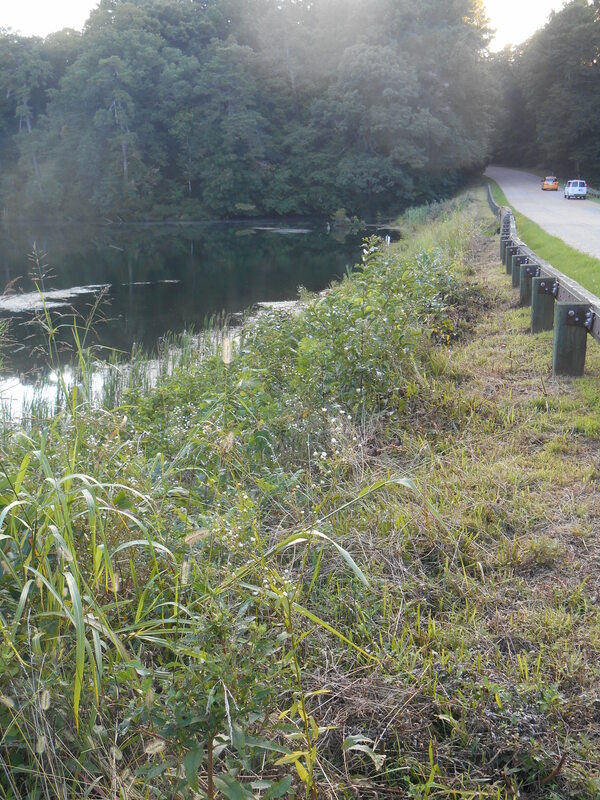 I know that many states have planted wildflowers and allowed native plants to grow along their highways. To me, this is not only common sense, but also a beautiful approach to highway maintenance. It certainly makes a trip more interesting for the traveler to have wide swaths of beautiful flowers and trees to enjoy along the roadside. 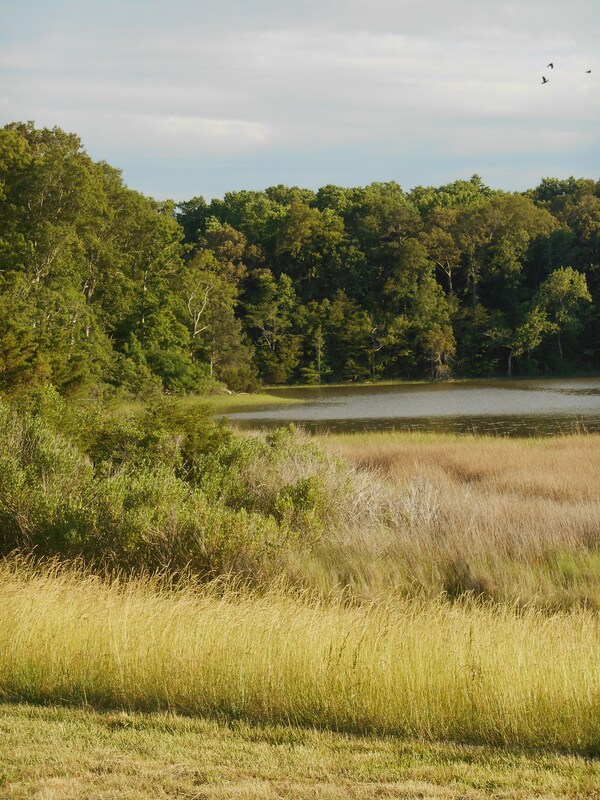 It helps travelers get a better “sense of place,” too, to see how native vegetation varies form region to region. But it also would save each Department of Transportation money that in currently spent mowing the roadsides and medians every few weeks. 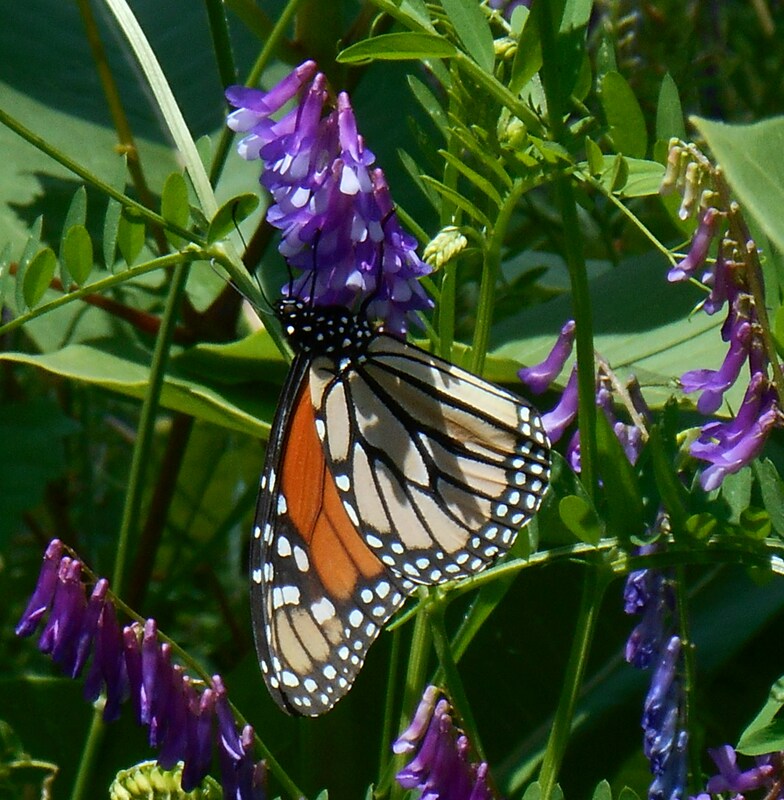 Our butterfly and songbird populations both would benefit from corridors of native plants all along our major highways. I hope that efforts to preserve habitat in Mexico, and efforts to curtail the use of insecticides and herbicides in all three nations prove successful. 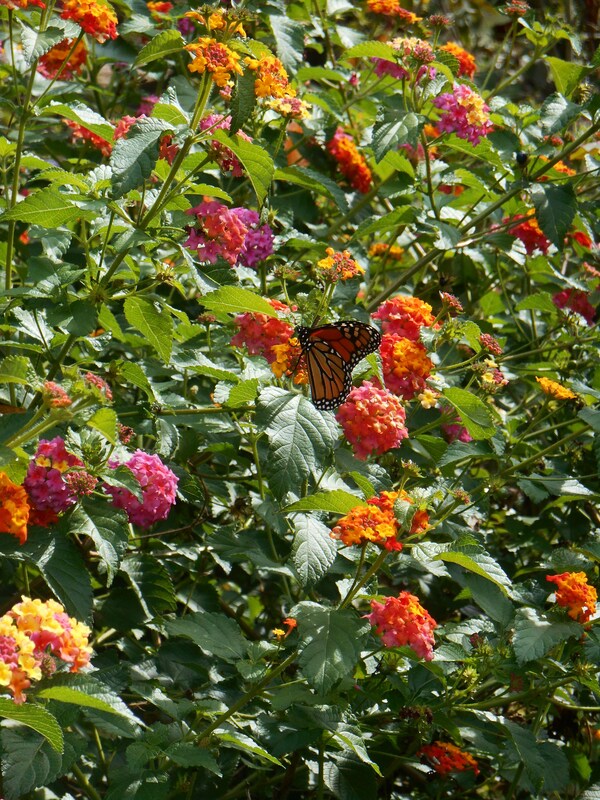 This is the patch of roses and Lantana where I found the Monarch this morning. It now reaches well over our heads. 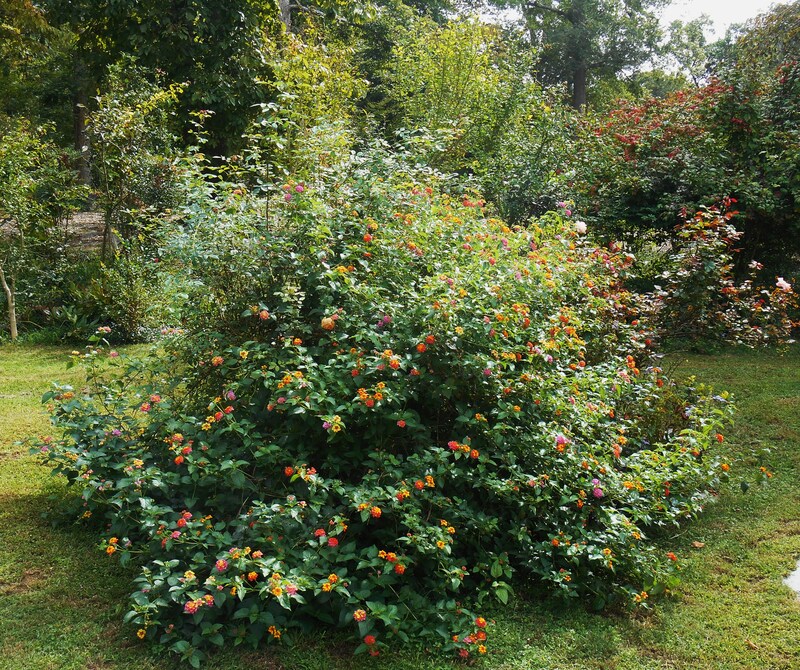 The Lantana are several years old, but still die back to the ground each winter. So this is one season’s growth…. 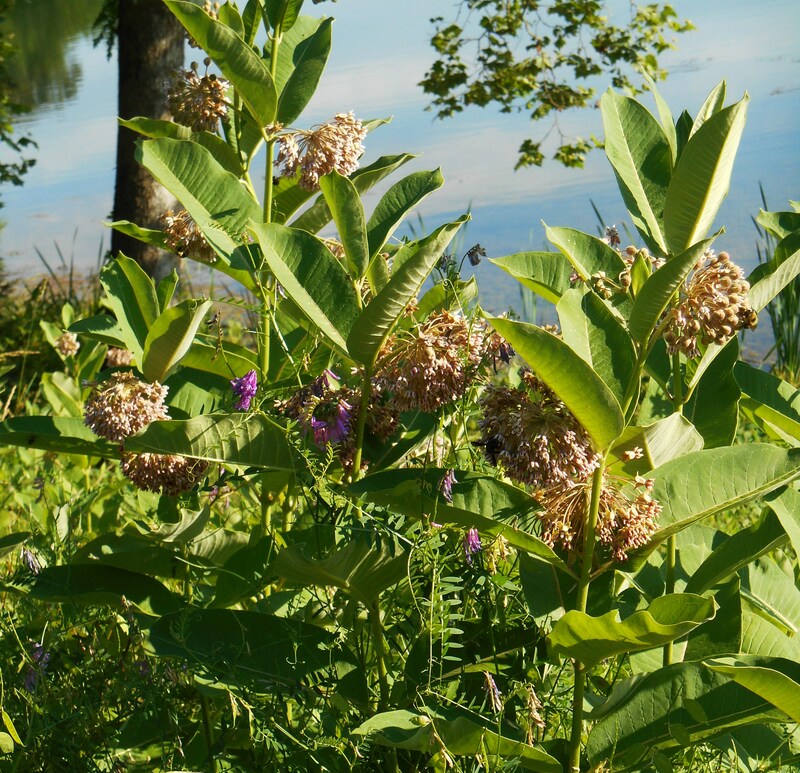 Efforts to plant more milkweed should be encouraged and supported by individuals and institutions, in addition to government agencies planting milkweed along the roadsides. We can all make a small effort towards providing a supportive habitat for wildlife and the specific plants our butterflies need to reproduce. 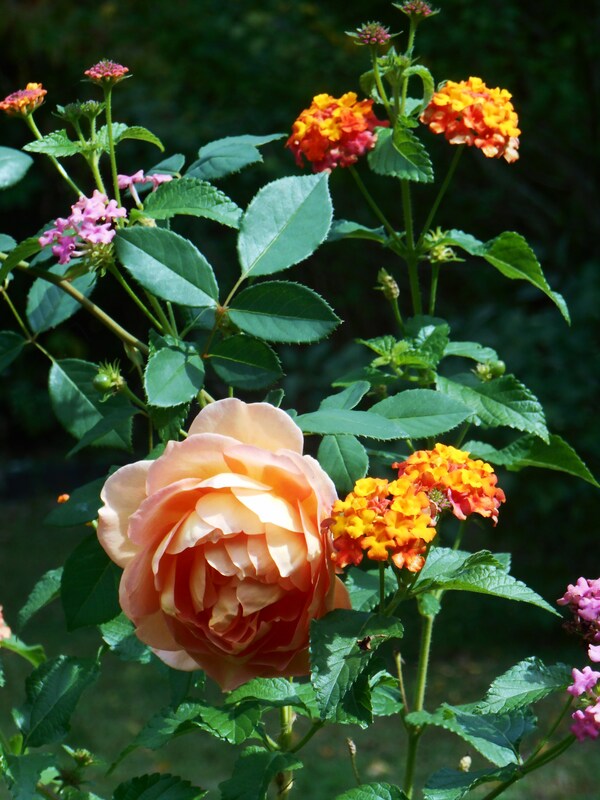 Many of us plant exotic plants and purely ornamental plants, like these roses, instead of Milkweed and other host plants for butterfly larvae. The dill, fennel and parsley we grew this year, host for swallowtails and other butterflies, weren’t eaten by larvae this season. 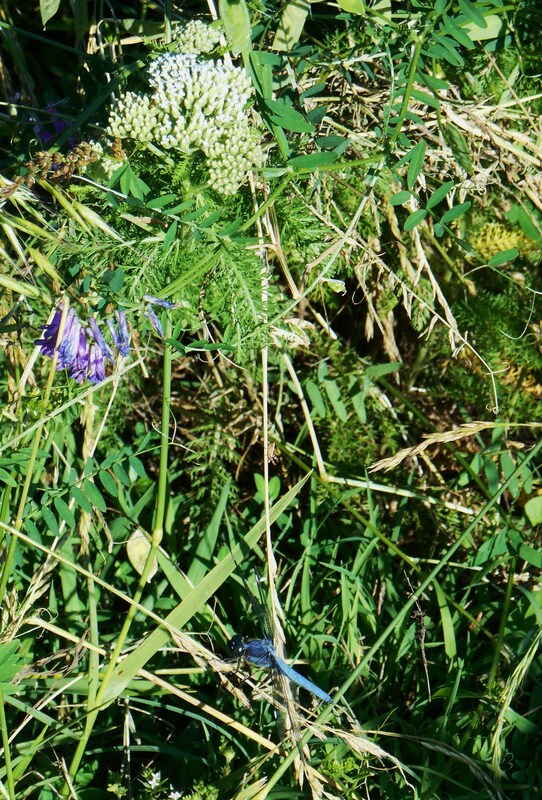 We have been concerned at how few larvae and butterflies we’ve spotted since spring. 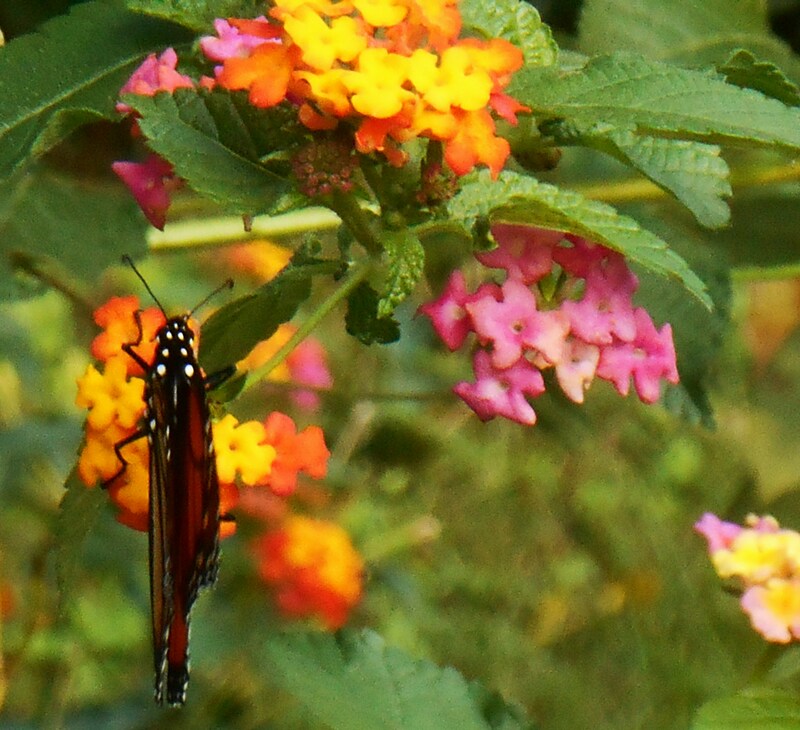 The third Monarch butterfly was feeding on our Lantana when I came out to work in the garden this morning. 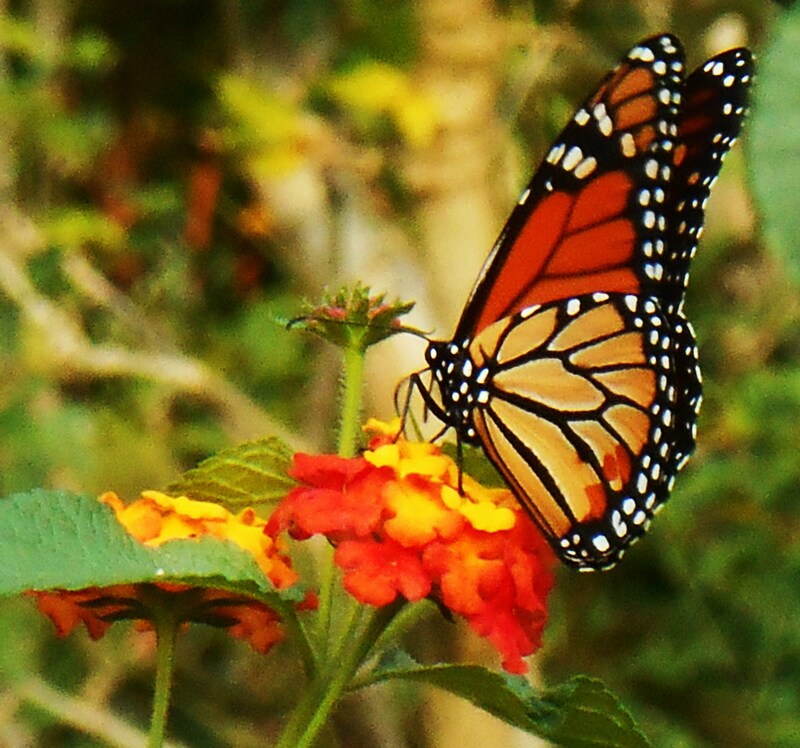 I was thrilled to find it there, and even happier that it was still blissed out on Lantana nectar when I returned with the camera. It kept peacefully feeding as I joyfully photographed its progress. 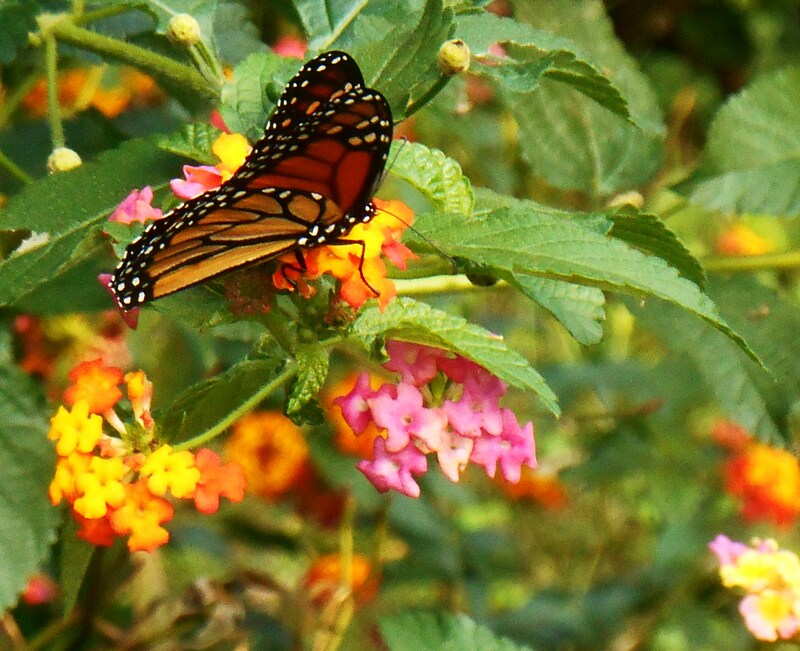 When it finally fluttered off, it was to another patch of Lantana a few yards away. 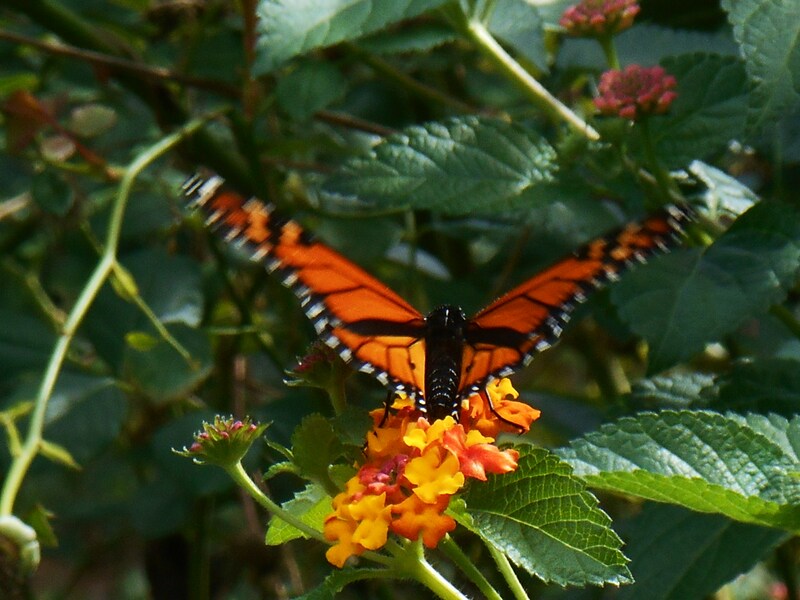 Although Lantana won’t support Monarch larvae, it offers a good food source to fuel the mature Monarchs’ migration this month. I hope you have recently spotted Monarchs feeding in your community. October is the time when they gather together for the long trip back to Mexico, where they will spend the winter. We also hope this winter is gentler to them than last, and that this beautiful species will not only survive, but will respond to our conservation efforts (as many eagles have) and become a common sight in our summer gardens once more. 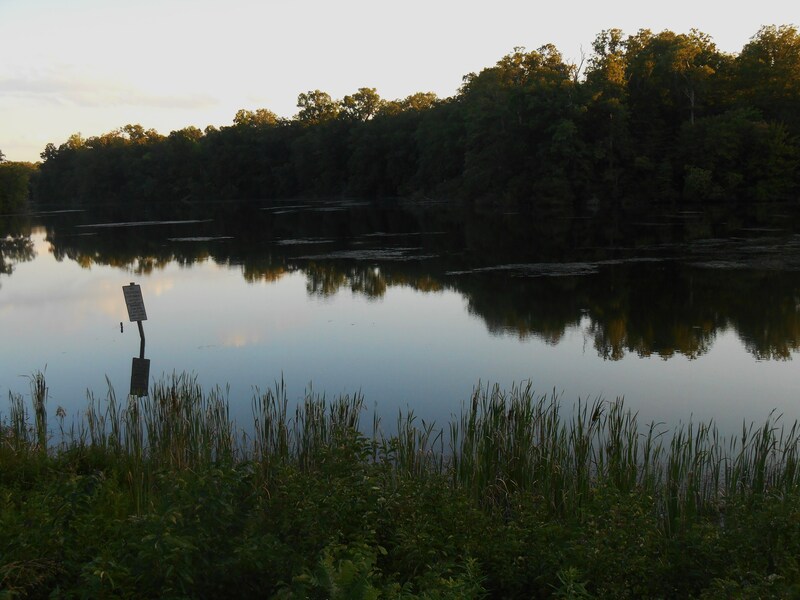 We returned to the pond, nestled along the Colonial Parkway between Williamsburg and Yorktown, hoping to find evidence of Monarch caterpillars and eggs. As soon as we arrived it was evident that summer has not been kind to this spot. Flowering plants along the edge of the road had been mown. I hope it was just mowing at least, and not herbicides, which turned this once beautiful area brown and grey. 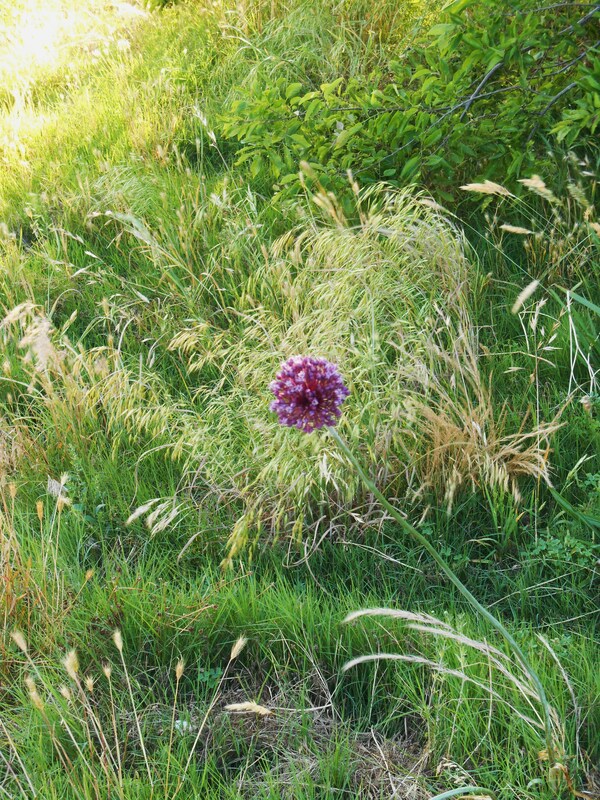 The Alliums, Daisies, Queen Anne’s Lace, Purple Milk Vetch and Milkweed, so vivid in memory, were gone. 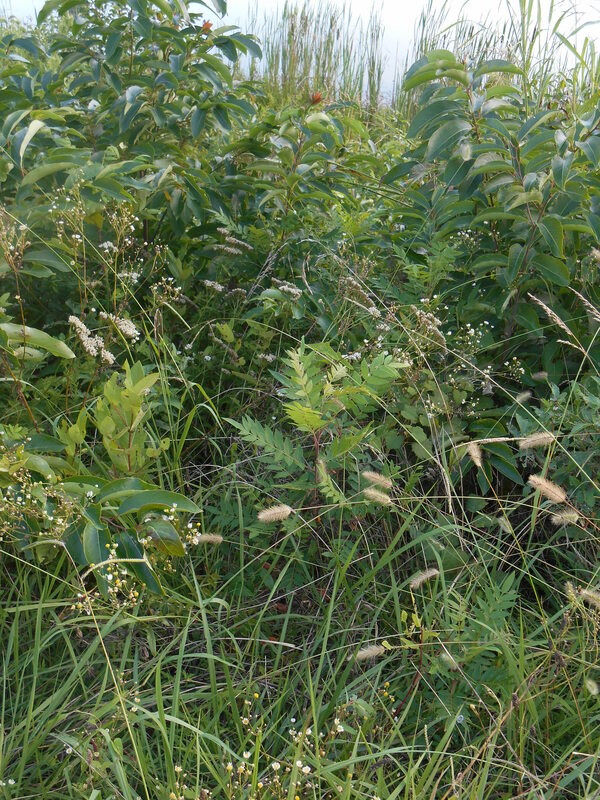 In their place we found various grasses, a patch of orange flowers, and Milkweed, now going to seed. Milkweed plants nearest to the parking area have obviously hosted caterpillars, many of their leaves methodically stripped away. In fact, we found quite a few caterpillars at their dinner. We also found a few spots of eggs. And while we were happy to find eggs and larvae, these are not the eggs and larvae of Monarchs. 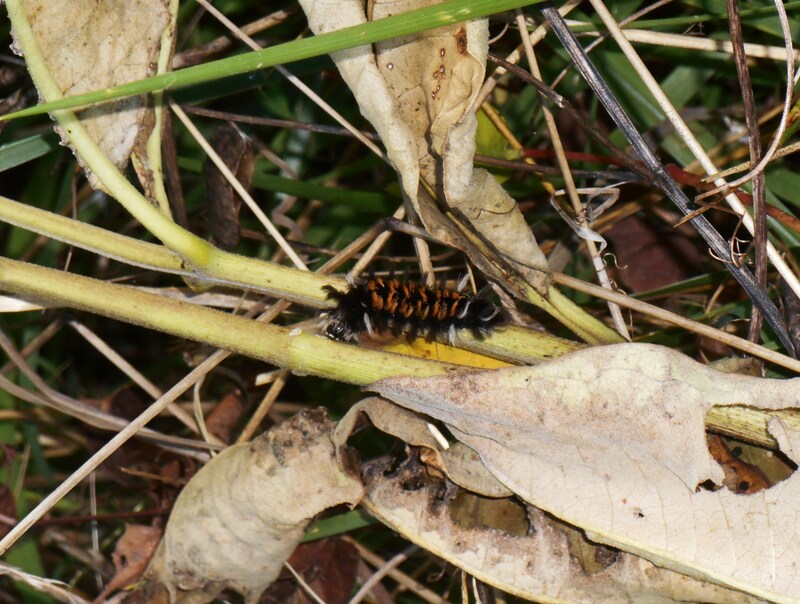 I haven’t yet been able to identify this caterpillar, and certainly appreciate anyone who is able to name it for us in the comments. 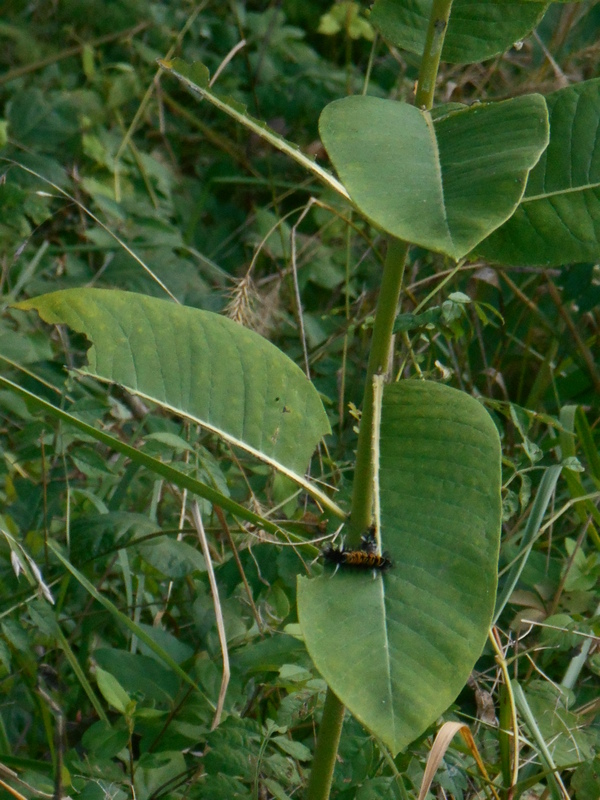 These caterpillars are drawn to this Milkweed, Asclepias syriaca, whether the plant lives or not. 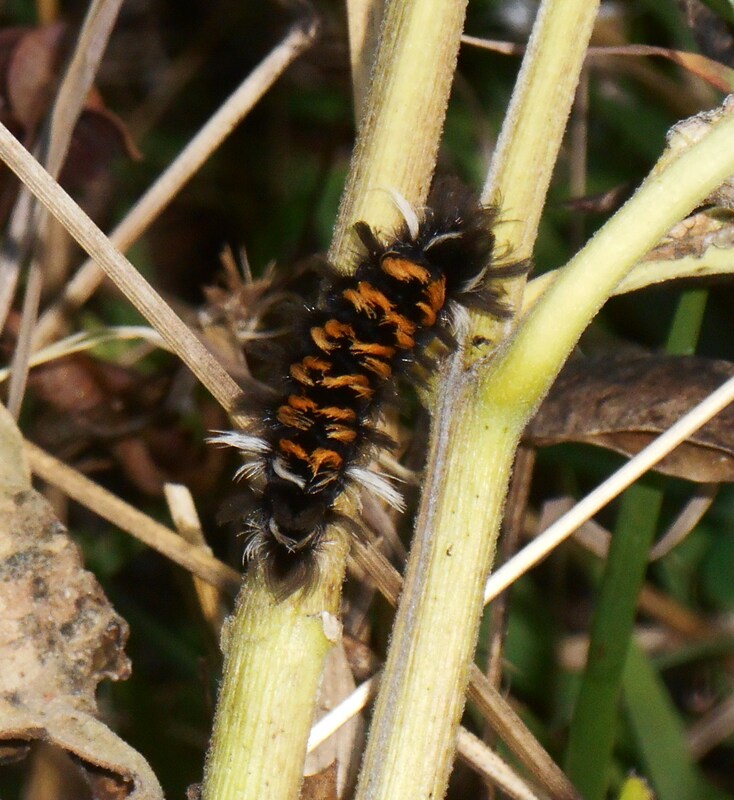 We found perhaps a dozen individual caterpillars while walking around the perimeter of the planting, staying on the mown grassy areas. The Milkweed plants further away on the slope didn’t show any obvious signs of chewing, although they continue to set seed for next year’s crop. 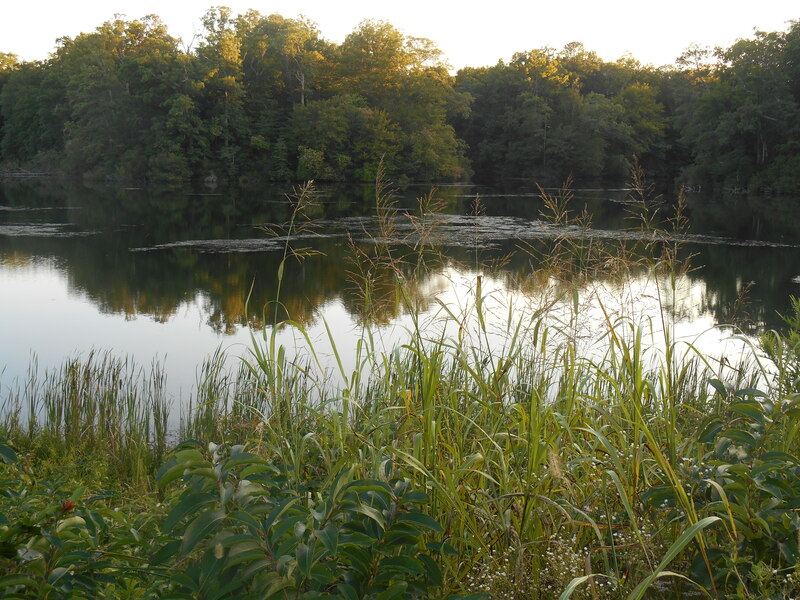 And we also didn’t spot any adult butterflies around the pond this evening. My partner spotted a turtle, swimming in the pond, as I hunted for caterpillars. And I enjoyed the company of dragonflies and grasshoppers. But that was all, late on a late July evening, as shadows grew deeper, and the golden rays of sunset touched the treetops one last time before slipping below the horizon. Eliza Waters is a wonderful advocate for wild creatures of all sorts, but she has a special interest in Monarch butterflies. 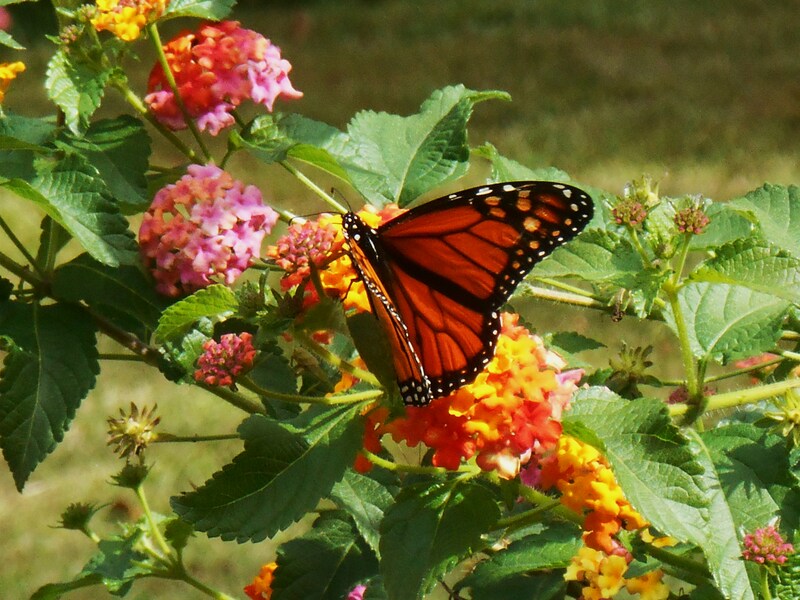 We have been corresponding this spring about the plight of the Monarch. She has been involved in creating habitat for them. 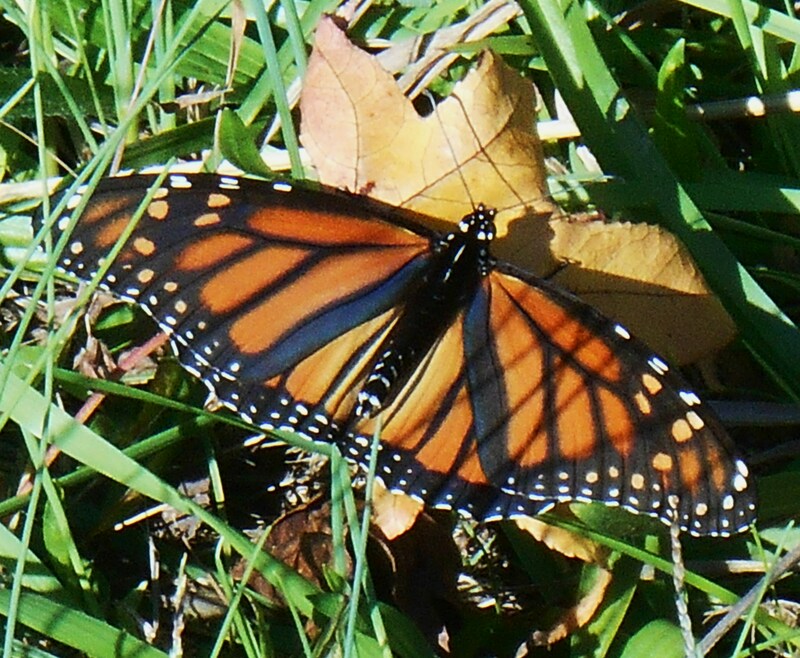 And she responded to the post with photos of a Monarch we found near Yorktown, Virginia, in late May. 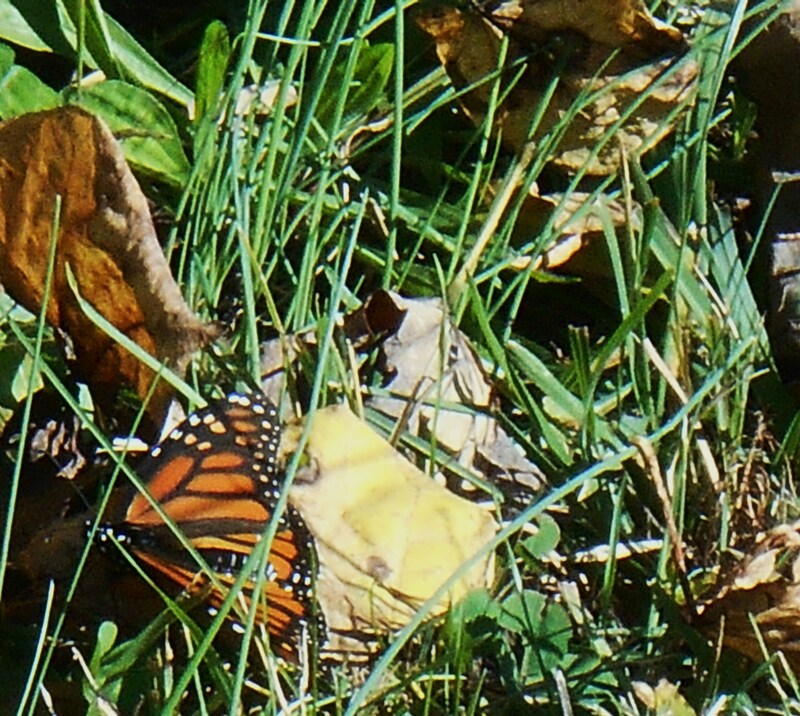 We found this Monarch on May 23, 2014. There was no sign of Monarchs today, sadly. 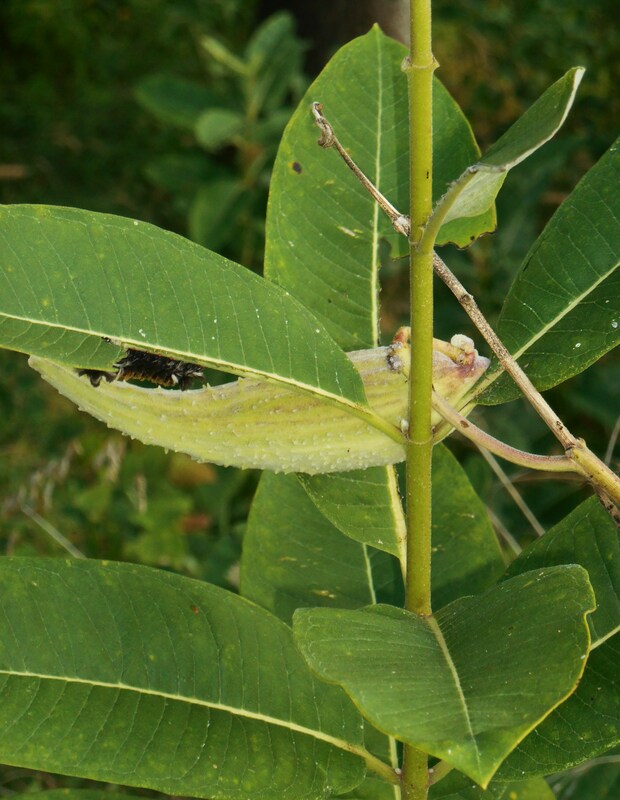 Eliza asked, earlier today, whether we had found any eggs or signs of Monarch larvae on the Milkweed by the pond where we have been watching for butterflies. So my partner and I returned this evening, to see what we might see. We found the Milkweed plants just covered in bumblebees, feasting on their tiny flowers just as the flowers were opening. And the bumblebees were so blissed out on the wonderful nectar, they were totally oblivious to my presence. Just inches away, they continued to feed while I took photos. But in the entire time we explored, there was only one small butterfly or moth. I don’t know its name, but suspect it is a moth. Not a single Monarch to be found. 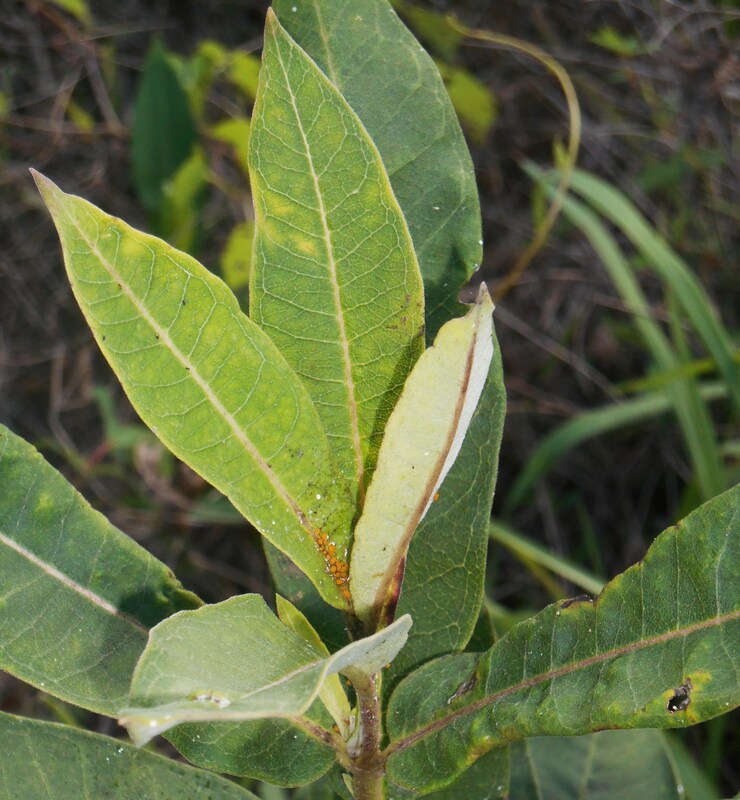 And at Eliza’s suggestion, I searched for signs of eggs or larvae on the Milkweed plants. I”m so sorry to say that I couldn’t locate either. 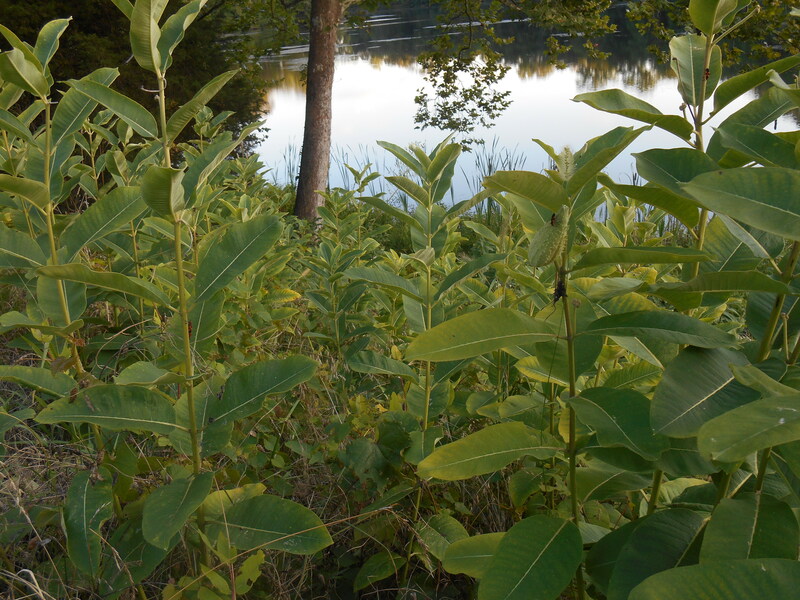 The Milkweed leaves look pristine- no larval munching. I checked the closest Milkweed plants and found no eggs, either. 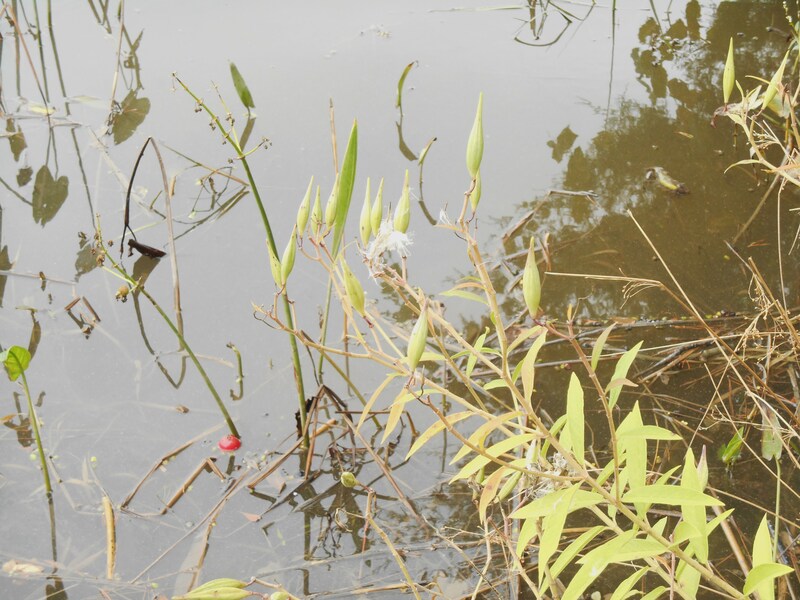 Perhaps the Monarch did lay her eggs on one of these plants closer to the pond; one I didn’t climb down the bank to inspect. Let us hope that is the case. And we’ll continue to check back from time to time to see what evidence we may find as the summer unfolds. 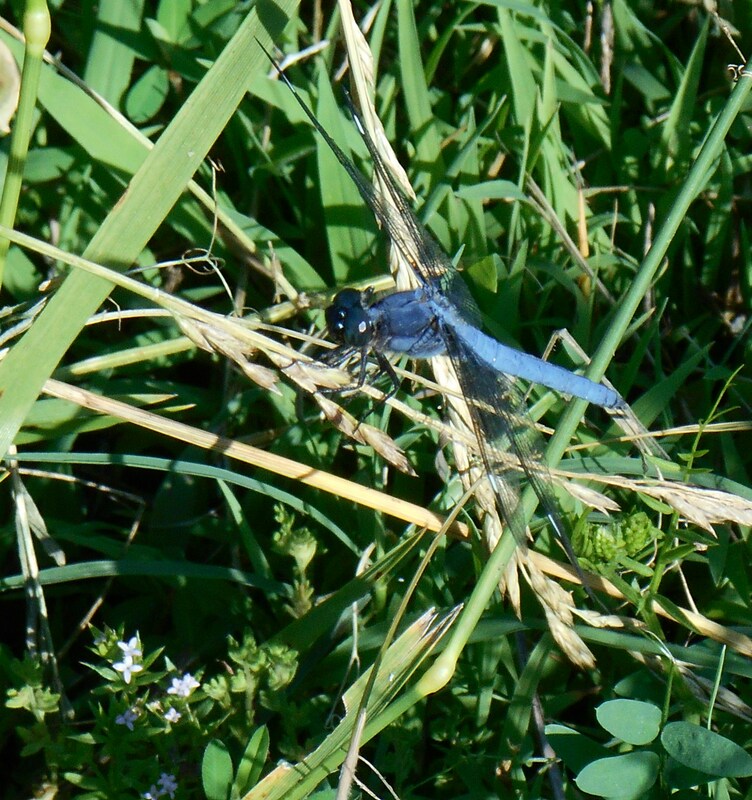 Today we were happy to find a brilliant blue dragonfly. He was quite happy to sit still while I snapped off several portraits of him. He was watching me, but didn’t even flinch until I moved away. He was a great sport, and I appreciate his patience. The swans have moved on, too. But we found Egrets wading further down the road. Early summer brings such a pageant of life to our community. We enjoy the staccato music of the frogs and the basso continuo buzzing of bees under the melody of birds calling to one another. So much life, and such beauty.